In the amateur astronomy community, long focal length (i.e. 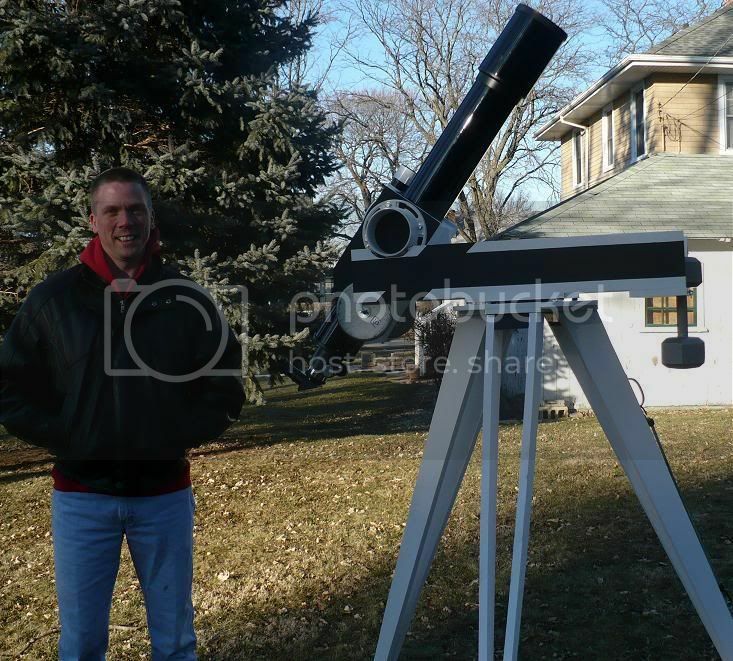 - long tube) refractor telescopes are semi-affectionately termed "yard cannons." They're long, they're bulky, and well - they kind of look like cannons in one's yard. 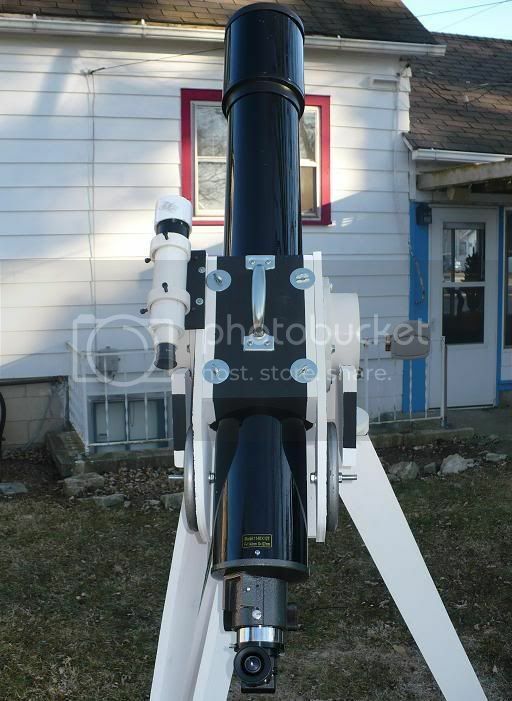 So when I picked up a 5" diameter refractor lens about a month ago, I had planned on making a "folded refractor" - or one that bounces the light off a number of mirrors, making for a small, compact telescope. So I thought, "Hmmm... I can spend a lot of time trying to figure out how to accurately bounce light off three mirrors, and subsequently lose a lot of photons in the process, or just build a huge freaking tripod/mount and have a yard cannon." So how did I go about building this monstrosity? Well, first off, I knew I wanted to be able to have the eyepiece, when pointed at the zenith, be at a relatively "viewable" angle. That necessitated a rather high tripod. 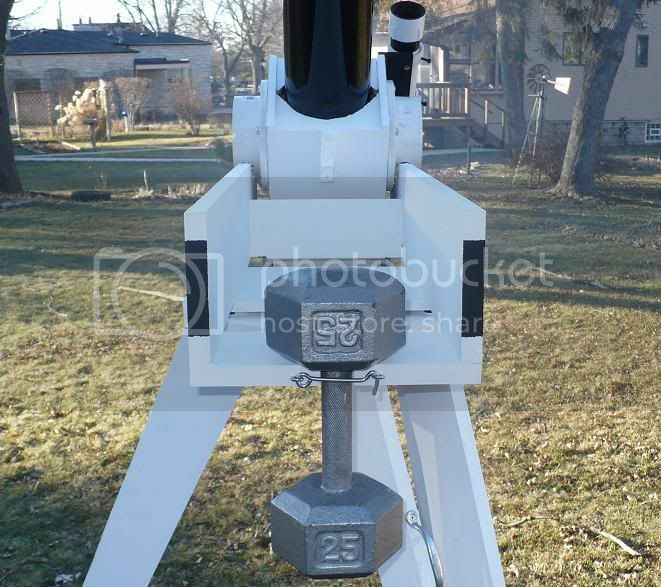 But when balancing the scope, I also realized that if it were to be that high at zenith, then the radius arm of the eyepiece would be HUGE, and therefore mean I'd need a stepstool (ladder?) to see anything below 40 degrees or so. Not the greatest option!! I made use of the CAD software that I have, and figured that by using counterweights in the right places, I could have a scope that keeps the eyepiece in relatively "normal" heights, and also not be so heavy or difficult to move. Well, it IS a little bigger than I'd hoped, but this scope is likely to be used more at home anyway, so it should work out fine for my needs. The tube is placed in a plywood "box" of sorts, that has the radius of the tube cut into the ends, with a removable top. The top then has four thumbscrews that allow for tightening the scope in place, or loosening it slightly for minor balance adjustments. It actually balances across a pretty wide range before requiring rebalancing (I'd estimate 35-45 degrees or so). The finderscope is bracketed onto that box, and is high enough that I can still stand and not have to contort too much to point towards the zenith. Note in the picture above, two 5 pound weights are bolted to each side of this box to counterbalance the rather weighty 'lens end' of the scope. Some rather convenient PVC plumbing parts are used as the bearing surfaces, which then rest on nylon furniture glides. Very smooth movement - nice! The handle is place so that when transporting the scope, it balances and remains level. Since the scope/box/5 lb weights assembly weighs about 30 lbs, I have counterbalanced this by placing a 25 lb weight on the opposite side of the azimuth assembly (and slightly further out, balancing it all rather well). I realized that I couldn't juggle a 25 lb weight on one side and a 30 lb scope assembly on the other, so I placed nylon gliders underneath the azimuth assembly to brace it "up" to avoid putting too much strain on the Lazy Susan bearing when placing the weight / scope in place. At the moment, there is a minor issue of them causing the scope to vibrate when turning it in this orientation, so I may remove the nylon bearings on the "scope side" of things. That should help it move more smoothly. And since I put the weight on before the scope, the strain on the bearing won't be an issue. 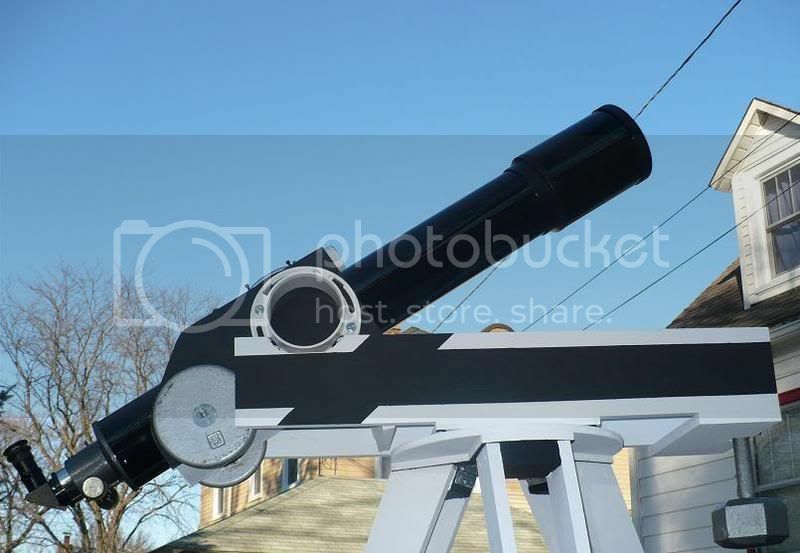 Eyepiece height when pointed at the zenith is 42". At full level, I can almost look directly into the eyepiece if it is placed in the focuser without a diagonal. Given that I have very little ability to see stars below 20 degrees where I live, the eyepiece is always in a "viewable" range. My hope is that this kind of project will inspire others to be creative about designing their own mounts that are stable and user-friendly. This isn't an ideal mount for everyone, but if it helps get the creative juices flowing for someone else, I'll feel good about that. Best of luck with your projects, and clear skies! 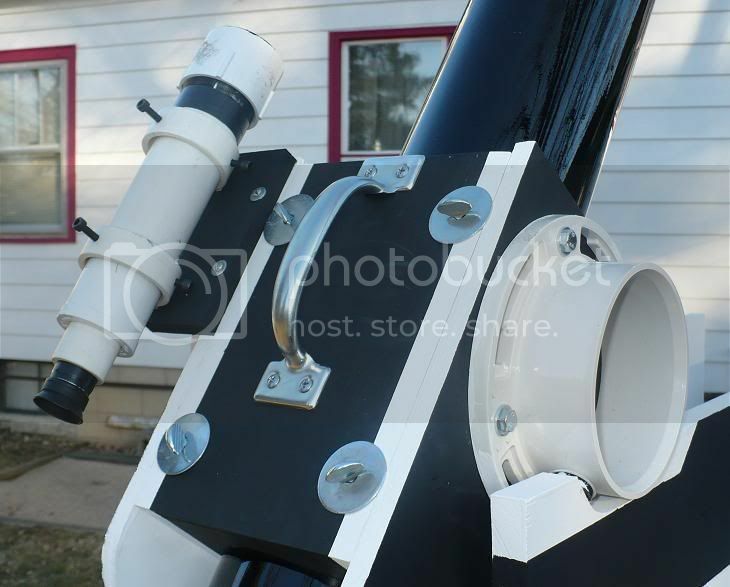 NOTE: This telescope mount got redesigned. See this page for the updated mount. 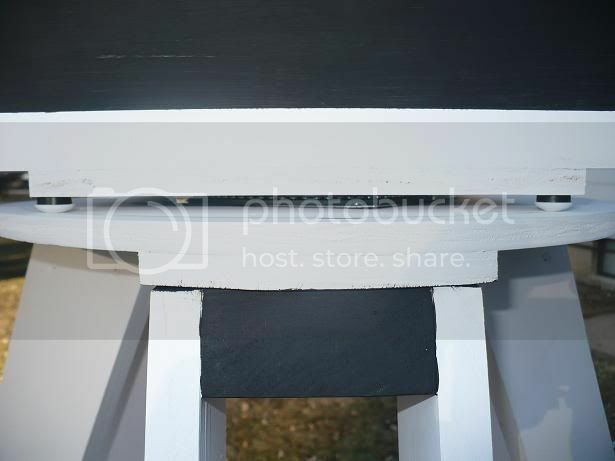 However, if this mount gives you any ideas to help you design something useful for your project, then this page will have served it's purpose.